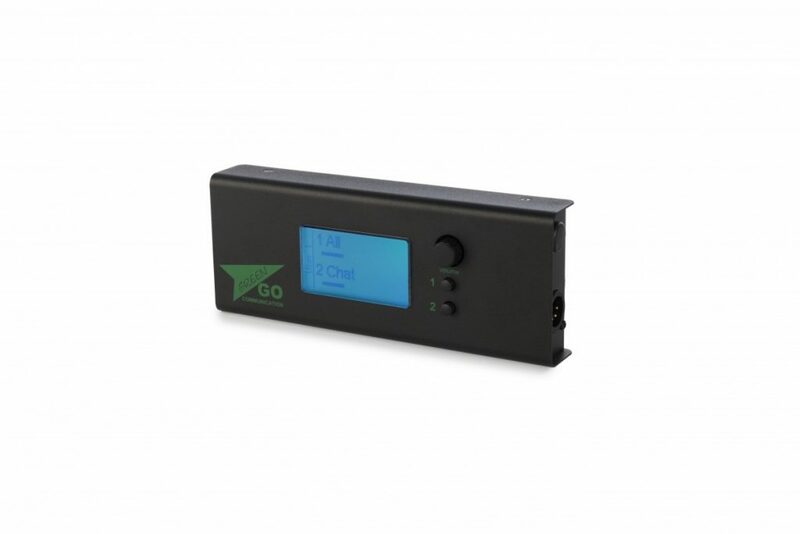 The Green-GO Wall Panel Headset version is a panel-mounted version of the Green-GO Beltpack with direct access to two communication channels (either a single direct user or a group). On the side of the Wall Panel is a 4-pin XLR connector to connect a headset to. The Wall Panel Headset version has a large LCD display which also acts as a cue acknowledgement push button. The display has an RGB backlight that will light up the screen in different colours depending on the cue status, next to displaying textual information. On the front of the Wall Panel is a rotary encoder which acts as a master volume control. When pressed, the encoder answers the most recent audio source. Two buttons on the front of the panel provide instant access to the two communication channels. All matrix data is stored internally.